Cindy recommended I highlight this comment from Ideealistin and what a beauty it is. I am glad Cindy pointed it our because it had snuck under my radar while I was away on the weekend of the the 15th. Here is a great tip sent to us in a comment from Sabine. If you are having trouble decluttering your wardrobe maybe this tip will be the plan you were looking for. Jane left this comment in response to Cindy’s column this week ~ How can you have MORE to declutter? Never be deterred by thinking will I ever be done decluttering. You are only finding more because you are continually getting better at it. Just keep pealing back those layers. I have brought this comment to the forefront in case anyone has some advice for Leah. My advice was to go cold turkey and put them in the recycling. We spend far too much mental energy over stuff that doesn’t really deserve our attention. Saving Advice ~ Use up, wear out, make do, do without. I just loved the motto to this blog. The Non-consumer Advocate ~ Use it up-wear it out-make it do-or do without-challenge And here is more of the same. The Zero Waste Home ~ A word on heirloom guilt This great post from Bea at The Zero Waste Home just goes to prove that getting rid of sentimental/heirloom clutter doesn’t make you a heartless person. It just makes you sensible. The memories are still there every day and many ways without the clutter to back it up. MiniMum ~ Top clutter – Paper-rules I loved Jess’s take on paper clutter in this post. One can never read enough blog posts on paper clutter until you are finally convinced you that you don’t need most of it. This blog post from Willow, one of my long time regular readers, just goes to prove that the good things in life don’t come in packages. 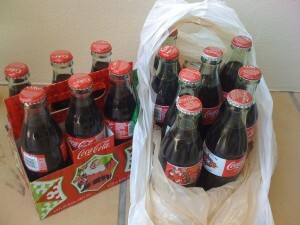 Freecycled last weekend were these 14 Coca Cola bottles. Needless to say there were many keen requests to take them off my hands. I am sure the new owner is pleased to have them in their collection. I know I was pleased to have them out of my garage. Some days just feel good and today was one of those days. Nothing special about it, it just went smoothly. I am grateful for that. Aww thanks Colleen, still feeling like a ‘Rock Star’! Is everyone going to try ‘Nothing in November’ I actually think I can get 1/2 of the way through November without buying groceries. I’ve stocked up on bread & milk (we tend to do that when the price is really good, and believe me with sandwiches and drinks at dance we definitely go through a lot). I still have meat, chicken & fish in the freezer & heaps of frozen veges & thanks to my BIL’s vege patch harvest, I have heaps of pumpkins, potatoes, sweet potatoes, onions and there will be fruits soon & beetroot, tomatoes and lettuces, and the best thing is it’s free, so it’s looking good for me. I reckon I may even come up with a few choice ‘throw it all together dinners’ haha. I do love a challenge! Lets see how I go, who’s with me? I am not sure i will get through two months without buying anything new but I sure am willing to try. The article you mentioned on “heirloom guilt” is well worth reading. I’ve tucked that blog into my feed reader! Thanks for sharing that. Thanks for the favourite blogs; always interesting to read new ones; a couple of very good today. Good effort Ann. I am glad you added that last sentence because I was beginning to think you had gone to all the bother for nothing. Now I am going to google men’s shelter in my town. I really don’t know of any but it is high time I found out. THANK YOU ALL for giving such great advices. Another use for all that shampoo-dilute it a bit with water and fill a squirt bottle. Keep it in the laundry and pre treat the stains on the inside of shirt colors, especially those work shirts! It really helps to remove the stains. Been doing this for years. Great tip Amy, thanks for that. i just posted your comment on Facebook so no one would miss it. 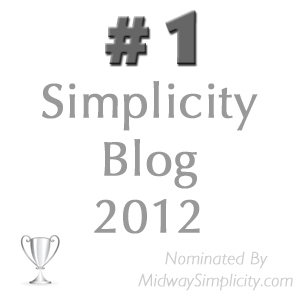 I think the community sense on your blog is really what makes it stand out from other blogs. It was a great revelation Ideealistin and one I hope everyone will come to terms with during the process of decluttering because it is the key to staying decluttered that’s for sure. I am glad you feel so at home here at 365 Less Things, I feel the same. It scares me sometime that my blog might get so popular that I couldn’t possibly answer all the comments. I suppose then I will have to make some sort of compromise but I really don’t want to. It always amaze me to see closets pictured in magazines. They look great but are almost always empty…. Conclusion: if you want your closet to look good, just empty most of it!